Two thumbs up for the “Pano” app for the Iphone. It’s easy and fun. Works very well. 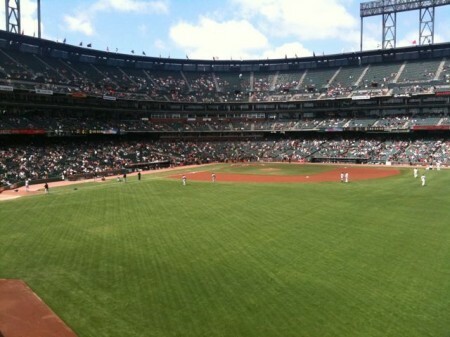 Went to the Giants vs. the Pirates this afternoon. Great game, the Giants were on fire. They won with the the long ball 6-0. It was also the first time I’ve ever saw a in the park Homerun. What was really amazing was the pace of the game. With the starting pitchers going late in the game and throwing strikes the game lasted only 2 hours and 10 minutes. It was a incredibly fast game. Typically after a day game and the attempt to return to Modesto during SF rush hour might be a painful multi hour commute in gridlock. Since the game speed by so quickly we were home by 5:30pm less than a two hour ride home. AMAZING!! Went with the Data Path guys. We had a very enjoyable, warm and sunny day. What the heck was that guy smoking? I’m testing WordPress iPhone app. Besides being hard to type on such a small device, I think it works pretty good. Anyone have any thoughts? Anyone I know purchasing an IPad? I won’t be right now but I can see myself getting one on the next version. Maybe when they reduce the price I’ll get one, just as they did with the IPhone. I’m typically not an early adopter.